The lighthouse is situated on the north west extremity of Trevose Head on the North Cornish coast, with granite cliffs rising a to a height of 150 feet. 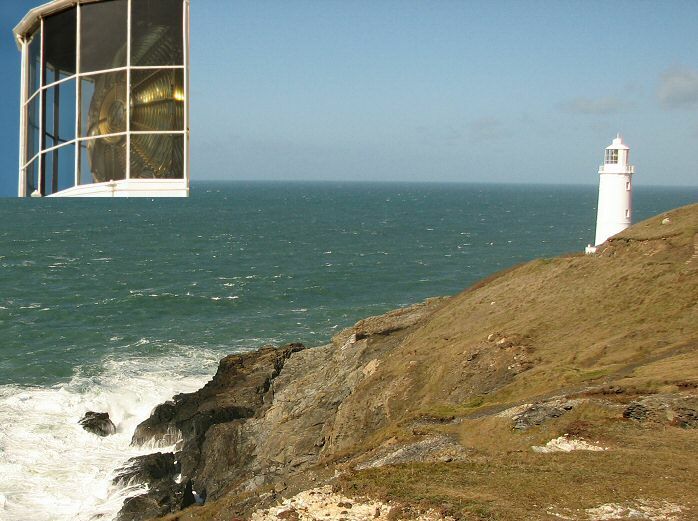 Built by Thomas and Jacob Olver of Falmouth, the first light was shown here on 1st December 1847 and was a simple oil light backed with reflectors. Originally there were 2 fixed lights; a high light in the tower we see today and in front of this a low light. This was changed in 1882 when the low light was discontinued and an occulting light replaced the high light in the tower. In 1913 a fog signal was installed being long overdue on such a foggy coast. The lighthouse was automated in 1995 and is now remotely controlled from the Trinity House Operations Control Centre at Harwich in Essex. The old keeper cottages are now available as self-catering holiday lets.